* AMTEK AUTO: Amtek group company Rollatainers has sold its stake in a company that holds the licence to run American quick-service restaurant chain Wendy's outlets in India. * BHARAT ROAD NETWORK: The company said Religare Finvest has filed a case against it before the Kolkata bench of National Company Law Tribunal under the Insolvency and Bankruptcy Code, 2016, claiming a default of 513.01 mln rupees. * BEML: Suraj Prakash has been appointed as the Director-Finance and a Member on the Board of the company. * BIOCON: Has received the European Union Good Manufacturing Practice certificate for its sterile drug product manufacturing facility in Bengaluru. * CHOLAMANDALAM INVESTMENT AND FINANCE CO: Hopes to maintain its strong growth in the vehicle finance segment, revive the home equity business, and achieve significant growth in housing loans this fiscal. * COAL INDIA: In the wake of coal shortage prevailing in the country since the last 10 months, state-owned Coal India Ltd has said that it will achieve its target of 1 bln tn per annum output by March 2023, Coal Minister Piyush Goyal said. * FEDERAL BANK: The Reserve Bank of India has approved the reappointment of Ganesh Sankaran as executive director of the bank, till Jul 3, 2020, as recommended by the board. The plan of promoter banks to sell stake in IDBI Life Insurance Co, a subsidiary of the bank and IDBI BANK, is on track despite Max Life Insurance Co Ltd pulling out of the race. * FIEM INDUSTRIES: Has entered into a technical assistance agreement with Japan-based Toyodenso Co and Toyota Tsusho Corp for manufacturing bank angle sensors for motorcycles for the Indian market. * FORCE MOTORS: Total sales in June were at 2,669 units, up 8.2% on year. * FORTIS HEALTHCARE: The 4.45-bln-rupee Inter Corporate Deposits that were allegedly diverted from the company by its former promoters, the Singh brothers, were originally placed in custody with a little known company that had acquired loans from RELIGARE ENTERPRISES, their financial service arm, as part of an attempted settlement. * FUTURE LIFESTYLE FASHIONS: The board has approved a proposal to acquire 29.9% stake in UK-based Koovs for up to 15.3 mln pound sterling (around 1.4 bln rupees) in one or more tranches. * HERCULES HOISTS: The management of the company has concluded a settlement agreement with Jai Bharatiya General Kamgar Sanghatana, Panvel in Maharashtra, representing the workers at their Khalapur unit. * HDFC BANK: Has entered into a pact with the government to offer its banking services and products at Common Service Centres through 'Banking Correspondent' model. * HINDUSTAN AERONAUTICS: New India Assurance will have to fork out around 2.5 bln rupees in insurance claims to the company, following the crash of its Sukhoi Su-30 fighter jet near Nashik last week. * HOUSING DEVELOPMENT FINANCE CORP: Chairman Deepak Parekh has reiterated his pitch for allowing housing finance companies to fund land purchases for affordable housing. After the listing of HDFC Life Insurance, the next listing within the group will be of the asset management joint venture with Standard Life, Parekh said. * ICICI BANK: Said its mortgage business has crossed 1.5 trln rupees and it would target 2 trln rupees business by March 2020. The Securities and Exchange Board of India has set a fresh deadline for the bank and its Managing Director and Chief Executive Officer, Chanda Kochhar, to reply to a show-cause notice over alleged violation of listing disclosure norms. Its mortgage loan portfolio crossed 1.5 trln rupees, a first among private sector banks in the country. It now aims to grow its home loan book to 2 trln by 2019-20 (Apr-Mar). * IIFL HOLDINGS: CDC Group, the UK Government-owned private equity company, has invested 3.25 bln rupees in rupee-denominated Masala bonds issued by the company's subsidiary IIFL Finance. * INTELLECT DESIGN ARENA: Will deploy its payment services platform to Banco Santander, a Spain-based bank. * JAIPRAKASH ASSOCIATES: The Supreme Court has asked the company to devise a plan, backed by a bank, to deliver flats by its subsidiary JAYPEE INFRATECH to aggrieved buyers. * MAHINDRA & MAHINDRA: Total vehicle production in June was up 17.9% at 46,226 units, against 39,201 units in the year-ago period. * MARUTI SUZUKI INDIA: Plans to add another 750,000 units manufacturing capacity from three production lines in Gujarat plant by 2020, taking the total capacity to over 2.25 mln units a year. * MUTHOOT FINANCE: Plans to grow its personal loan book size to 3 bln rupees by the end of this fiscal by expanding to all southern states. * NBCC INDIA: The Delhi High Court has indefinitely extended stay on tree felling for redevelopment projects in Delhi, including the three being executed by the company. * NMDC: After a long-drawn battle with Karnataka's steel producers, the company has cut the base price of iron ore by 300 rupees per tn. * NTPC: Total shareholding of ICICI Prudential Asset Management Company in the company has increased to more than 5% following the purchase of shares under the fund house's various schemes. * OIL & NATURAL GAS CORP: After a lukewarm response from the industry to the sale of its 51% stake in Pawan Hans, the Department of Disinvestment and Public Asset Management is planning to put the entire helicopter company on sale by offering the remaining 49% stake as well. 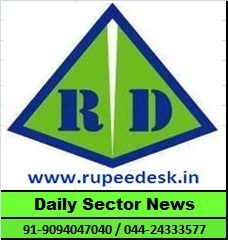 * RAVI KUMAR DISTILLERIES: Securities and Exchange Board of India has imposed a fine of 1.5 mln rupees on three entities for failing to submit information in a case related to IPO of the company. * RELIANCE INDUSTRIES: Reliance Jio fared poorly in the Telecom Regulatory Authority of India's quality of service norms which require a telco's customer care centre to answer consumer complaints within a stipulated time. * SEAMEC: The company, in consortium with Kreuz Subsea, has entered into a contract worth $22 mln with OIL & NATURAL GAS CORP for charter of Kreuz Glorious vessel for two fair weather seasons. * SHRIRAM TRANSPORT FINANCE CO: The company said that its promoters are in talks with SVL Group to ensure that the latter makes payment of dues to the company on or before the stipulated date. * SOM DISTILLERIES & BREWERIES: Som Distilleries & Breweries Odisha, a subsidiary of the company, has acquired abrewery in Odisha for 460 mln rupees. * TECH MAHINDRA: Will set up a blockchain centre within its research and development arm 'Makers Lab' at its Hyderabad facility in order to facilitate co-innovation in the space, developing enterprise grade solutions for customers across industries globally. * TITAN CO: Sales growth in the company's jewellery segment during Apr-Jun has been muted due to poor consumer sentiment and a high base in the corresponding quarter last year. * VIJAYA BANK: Has revised its marginal cost of funds-based lending rates for some tenures, which will be effective from Thursday, the lender said. * WIPRO: Has promoted Rajan Kohli, the head of its digital business, to the rank of president, a move analysts said underscores the significance of new solution offerings in the revenue portfolio of the Bengaluru-based company. * YES BANK: Has received final approval from the Securities and Exchange Board of India to start its mutual fund business.